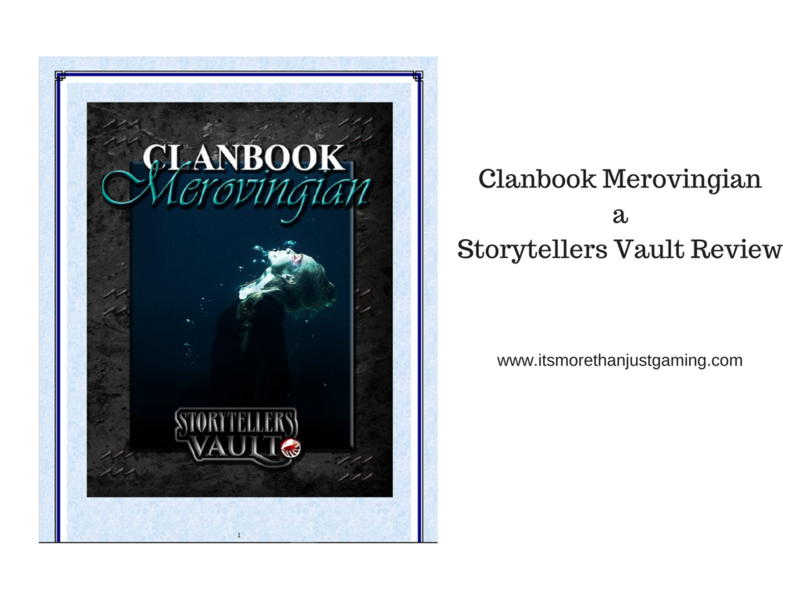 Clanbook Merovingian deals with the bloodline known as Dreamers, or sometimes even Mermaids. They are a bloodline of vampires that are almost exclusively female (there are exceptions, but they are few and far between) that claimed influence in the post Roman Era of Gaul, what would eventually become known as the Holy Roman Empire (and forgive me if I am slightly off here, my knowledge of post Rome Gaul is limited) and modern day France. Clanbook Merovingian covers the theories surrounding the origins of the bloodlines, talks about their unique discipline of Augury and also their unusual sleeping habits (They can only sleep whilst immersed in water). No definitive origin is supplied, though a number of theories are advanced. This is fairly common in sourcebooks for Vampire: The Masquerade, and whilst it is sometimes annoying as it sometimes feels like the writer hasn’t made a decision and just left it it open ended, it is also quite useful for intrepid storytellers who can take all the clues and rumours and put their own solution or stamp on it. Basically, two storytellers could read this book and decide on two different origins and it might make a difference to how the bloodline is portrayed. There is a fair bit of historical detail crammed into a relatively low number of pages, talking about the various noble families in Europe that the Merovingian Bloodline latch onto in order to survive, despite seemingly disappearing hundreds of years before the modern nights. Blue has a fair amount to say about how the bloodline interacts in the Dark Ages version of Vampire, as this is the point where the Merovingian Bloodline hits its peak, though falls into decline the closer we get to Tudor times. Portraying them as seers that ally with the High Clans most often, though sometimes reclusive seers who become addicted to sleep as it is the only method by which they can access their powers of Augury, which allows them a glimpse into the future. At higher levels of Augury, the glimpse becomes significantly more detailed and the Dreamer gains a degree of agency over their dreaming. This book also contains a some archetypes for storytellers to use, and a handful of “Canonical” (canonical to Merovingian Lore, but not part of World of Darkness Canon) Merovingian Vampires, including the eldest surviving, Elizabeth Pembroke (Whose real, mortal name might just be a bit more to familiar to you. But you’ll need to buy the book to find out what that is). It is always good to have another bloodline to play with, and given this is community content, it means that a storyteller can insert a character that their wikki searching players might not be able to figure out. The discipline Augury was interesting and has powers all the way up to level 7. There are a number of clan Merits and Flaws, which are useful. There is a page of opinions about the Merovingian from the other clans, and a page of Merovingian opinions about the other clans. This helps quickly give a broad overview of clan relationships. The character archetypes were interesting. The Historical references, whilst not exhaustive, are a good starting point about who you want to study if you wanted to construct a chronicle including or about Mervingians. Pembroke was overpowered, in my humble opinion. Augury, handled incorrectly, can either break the flow of the game or break the game. By that I mean that if a player Dreamer wishes to use Augury during a story, they must go and find a submerged sleeping space, and then make their augury role. Depending on success level, the Storyteller will then need to come up with a dream for them to have which has the requisite number of clues. Until level 4, other players cannot enter the dream. So, this could break the flow of the gaming session. This is also potentially very difficult for the storyteller to handle and balance. How do you come up with something mysterious, atmospheric with the same clue three times without being obvious on the spot? I know I would struggle and would have to have a stockpile of dreams that I could easily modify if I had a Merovingian in the Chronicle. And by Game Breaking, I am a bit wary as the description of the power is “Ask the Universe a Question and have it answered.” Five successes dictates give the player as much information as you can without derailing the story, which is fine if you are able to come up with an elaborate clue laden, mystifying dream sequence sort of like the Twin Peaks example supplied in the book. That then changes the nature of the game to trying to interpret the dream, whilst others do mundane stuff to unearth clues. Admittedly, that poses an interesting opportunity for a game that is a bit different. However, the danger is you give too much information (even by accident) and as such the players solve your adventure too soon. (I am not arguing player agency here, but a story should be a journey). I have a concern about the ease of getting answers as this is not the only instance of a power that answers questions; there is a similar ability in Abyssal Mysticism, however, the complexity of the question increases the difficulty of the ritual involved and can lead Abyssal Mystics to enter torpor for decades or centuries whilst they look for the answer.